There's no better way to finish an awesome season of mountain biking than with your favourite local ride. Jamie is feeling a bit sad today. 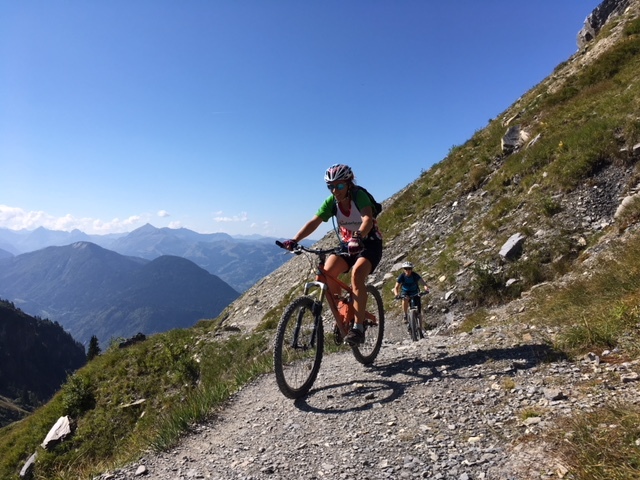 Yesterday was his last day of guided riding for this summer season but what a cracking day it was! 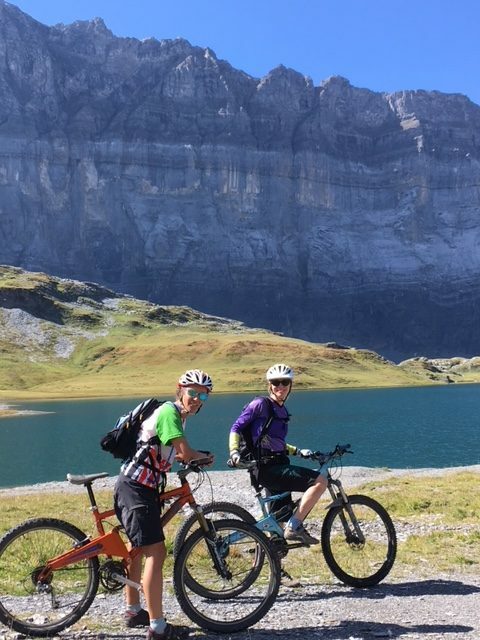 Jamie has been guiding Steve this week who is over from New Zealand and squeezing a few days of mountain biking in the Alps into his itinerary. 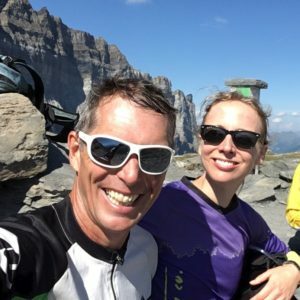 Steve is a first time visitor to the Alps and he’s been blown away by the trails and the views. The weather is amazing right now with big blue skies and warm sunny days. 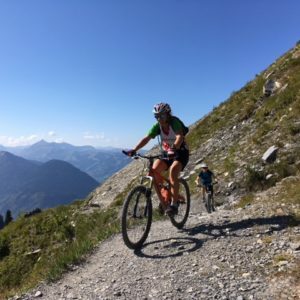 Jamie has been showcasing the best of our Alpine Singletrack trip featuring a big descent from the Col de Joux Plane, the Chamonix valley and up and over the Col D’Anterne. With work and childcare commitments it’s not often that I get to join Jamie out on the bikes anymore but Steve was kind enough to let me and my friend Rachael join in this week so Jamie and I had two rides together to mark the end of the season. 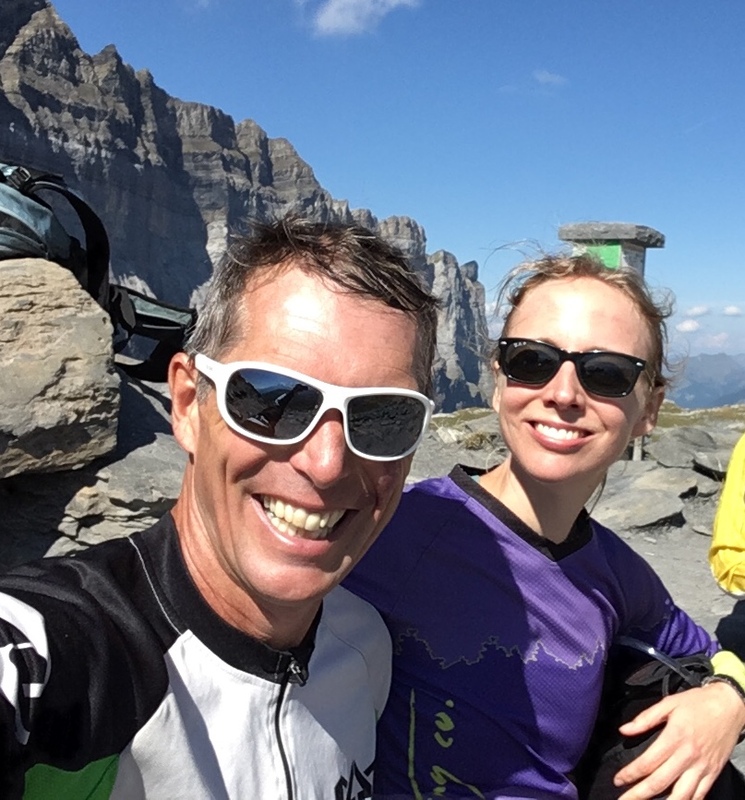 The Col D’Anterne is Jamie’s favourite local ride and I’ve been wanting to do it for years. 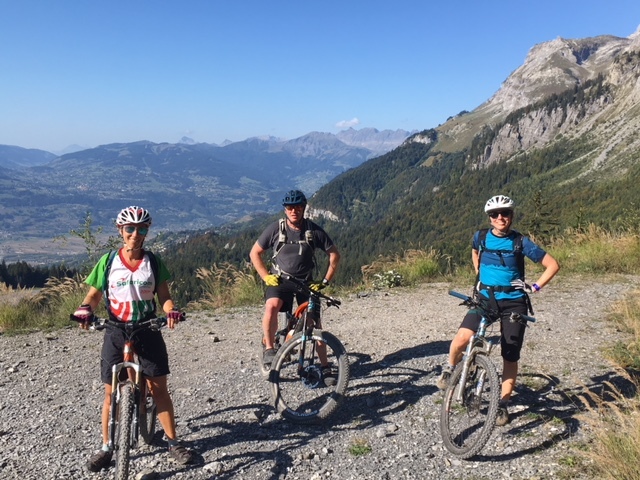 I’ve ridden it coming out of our valley and over to Chamonix during one of our old Morzine to Chamonix trips but never the other way round. We got a lift round to the far side of the Col in the morning with the van doing some of the climbing for us. We still had a tough 900m climb to the Col. It was mostly on ride-able double track but it’s steep and loose in places and is definitely a good workout! The last 25 minutes to the Col is a push/carry but it’s absolutely worth it for the stunning views and amazing riding off the other side. After lunch on the Col we had to tear ourselves away from those glorious Mont Blanc views and set off on our epic 1800m descent. The trails are in perfect condition right now. 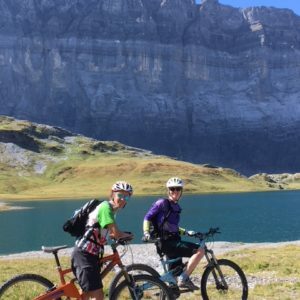 It’s a bit rocky off the top of the Col down to the Lac D’Anterne but not enough to interfere with the flow of the riding. The Lac D’Anterne has to be one of the most picturesque lakes in the French Alps. Such an idyllic spot! From the Lac we climbed up and traversed round to the Petit Col D’Anterne on some beautiful singletrack. Then it was down, down, down fast and flowing between the switchbacks all the way to the beautifully located Refuge des Fonts. From here it’s a mixture of double and singletrack back to the valley floor via the stunning Cascade de Rouget. We then picked-up the valley trail to ride all the way home off road. The perfect way to finish a big day out on the bikes. Steve said it was the best day of his life! It’s certainly the best day of Alpine riding Rach and I have had for a good few years and it’s still Jamie’s favourite local trail. 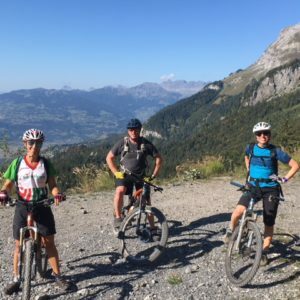 We’ve still got one self-guided group about to set off on the last Tour du Mont Blanc of the season but in terms of guided riding it’s all over for another year. Many thanks to all of you who rode with us this summer. We hope to see you all again soon!